Fearful of giving up your favorite foods if you try the Mediterranean diet? You don’t have to be! Restricting foods you love and avoiding major food groups is not a helpful or smart way to eat healthier. In fact, most people are unable to stick with diets because they are usually too low in energy (aka calories), leaving people to feel hungry and tired. So why would the Mediterranean “diet” be any different? Well, this eating pattern is more of a style of eating, rather than a diet, because all foods can fit. 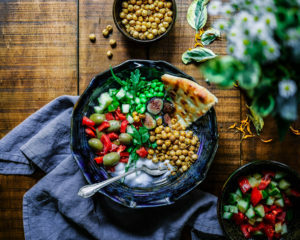 To follow the Mediterranean style of eating, it is important to focus on the types of the foods you eat and the way you eat them, rather than the amount or calories of the foods. This pattern of eating comes from people who live in countries that border the Mediterranean Sea, such as Greece, Italy, Spain, and France. It is important to remember that eating is a way to nourish and fuel your body, as well as a time to enjoy other people’s company and feel a sense of community as you all share a meal. Eating the Mediterranean way involves slowing down while you eat, being mindful about the taste and textures of different foods, and enjoying every bite. A good way to practice this is by sitting down at a table with your family or friends for a meal. You may notice that if you are by yourself in your room doing homework or watching TV, you may eat really fast because you might be distracted by the other activities you are doing. If you are at a table talking with your family or friends, you won’t eat as fast because you will be enjoying other’s company. These are packed with protein and fiber to help you feel full. Soy foods such as edamame, tofu, and tempeh are some other plant-based proteins you might be interested in trying. Even though this eating pattern is promoted as “plant-based,” this does not mean you cannot have animal protein. The Mediterranean diet emphasizes eating lots of fish and seafood, in addition to other animal protein such as poultry (chicken and turkey), eggs, and dairy. Fish and seafood, such as salmon, tuna, and shrimp, contain omega-3 fatty acids, which is a type of fat that keeps our heart healthy and strong. You may see online that some websites talk about “low dairy” in the Mediterranean diet. However, this recommendation is geared towards adults. Teens need to make sure they are getting enough dairy during the day, through sources such as cheese, yogurt, or milk, because they are in their peak bone building years. Dairy is a great, easy source of calcium and vitamin D, which are two important nutrients in protecting the health of your bones. The last piece of the Mediterranean style of eating is using olive oil. Olive oil is a healthy fat that gives flavors to food, helps keep you full after meals, is good for your heart, and is important in making hormones (chemicals) in your body. The fat in olive oil is also necessary to absorb Vitamins A, D, E, K, which are found in fruits, veggies, and dairy. You can use olive oil in a variety of ways, from cooking food to drizzling it on salads and sandwiches, to add flavor and absorb those vitamins. So if you’re thinking, “What about the part where you said I don’t have to give up my favorite foods?” The answer is still, you don’t have to give them up! The reason why the Mediterranean diet is a style of eating rather than a diet is because all foods can be enjoyed. While an important part of this lifestyle is that most of the foods you eat are whole foods, this does not mean you can never have processed or sugary foods! These foods can still be enjoyed in moderation. The key message of the Mediterranean style is that the foods you eat should nourish and fuel your body so that you can live a long, happy life.